The Boss was blessed with the best parents one could ever imagine. Today is the day to celebrate Dads, so let me tell you a bit about The Boss’s Dad. We call him The Old Man because he just celebrated his 95th birthday on 2 June. The Boss took a road trip up to New Jersey to see The Old Man. The Old Man is as sharp as a tack and would give you a pretty good fight if you crossed him. I don’t recommend crossing him. The Old Man has lived the American Dream. 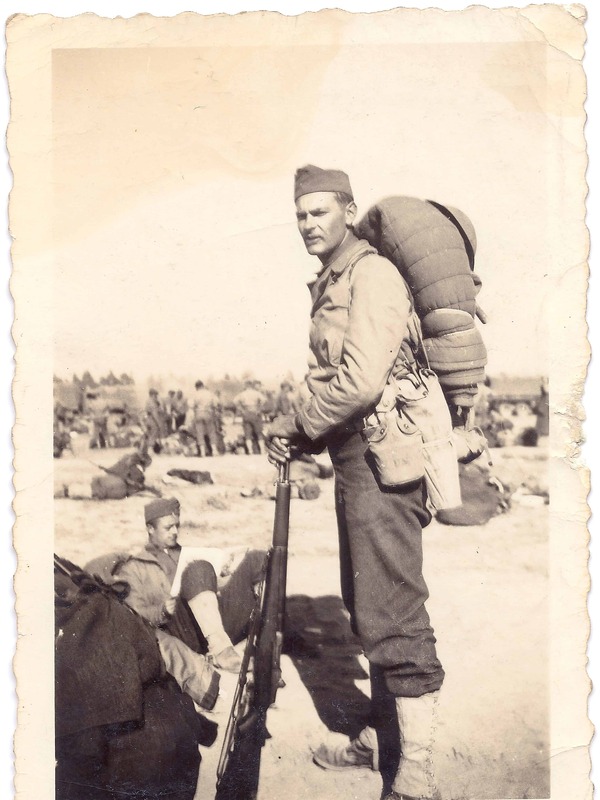 A son of the Depression, a World War II vet, a battlefield commission fighting the Germans in North Africa and Italy, career professional soldier, married the love of his life, raised a family, sent all three to grad school to get MBAs, retired from two different jobs and became a multi-millionaire the old fashioned way — saved his money and invested it wisely. At age 95, his only complaint is that all of his friends are or have died off. He has stared down ulcers, cancer and diabetes. He is fearless and I would bet on him — hand to hand — v the Devil any time. This is one tough SOB. The way he looks today, he will likely live for another 95 years. Here is a picture of him from November 1941 two weeks before Pearl Harbor. He is easily the smartest and most clever man that The Boss has ever encountered in his own life of soldiering and business. Not even close. The Old Man will not waste your time with pontificating but when he speaks you know that this is wisdom, real wisdom. The Old Man is all about doing and not talking. The Old Man has been a skillful money manager — well, Mom also when Dad was overseas — who never wasted his money on anything. The first house the family ever owned was a “fixer upper” in which The Old Man and The Boss did a lot of rehab work. The Boss probably developed his love of building and development from this experience. To this day The Boss thinks sawdust is perfume. The Old Man let The Boss do stuff instead of telling him all the stuff he could not do. When the basement was leaky, The Boss — about 12 years old — dug up the entire exterior wall of the basement (nice Jersey Shore sand and easy digging) and The Old Man waterproofed the basement. What was remarkable was that The Old Man let The Boss do this and that he had such confidence in him. This was real parenting. Growing the cubs to meet the world. The Old Man used to let The Boss shoot his .22 caliber rifle in the basement against a mattress propped against the back wall. The Boss spent many an hour shooting that little plinking rifle there. The Old Man has a moral compass that seems to be welded in place. It never wavers and it never moves with the pressure of the times. It is fixed and certain and predictable and does not fall prey to situational ethics. It is a steady pointer in a roiling sea. The Old Man — though a professional soldier and professional soldiers are prone to colorful language — never used profanity nor boastful speech. He was always mindful of his example in the presence of his family and children, in particular. It was his example that guided and educated his family and children. Once The Boss had been sent to an Army post barber shop to get a “flat top” and the Army barbers who were used to scalping recruits failed to deliver the ordered “flat top” and instead just shaved The Boss’s head. The Big Red Car could go on forever about the positive influence that The Old Man had on The Boss but I won’t. Thanks, Dad. You are and always will be the best. Thank you very much. Thank you, America, for the opportunities that you have provided and for the men you have created with those opportunities. God bless Dads everywhere. And, hey, even though I am a Big Red Car — today I know what the Hell I am talking about! This entry was posted in Fathers and tagged best ever, Dad, fathers day. Bookmark the permalink. Nice post JLM. As the saying goes, they don’t make them like that anymore. It’s strange that the older we get, the more we appreciate our parents. I often take my age as a reference point and think to myself – what was it like when my Dad was at that age? And I replay it to the best of my memory abilities. It’s an interesting reflection point. Best of health to him for many many more years! Yes, I find it interesting to think about my parents at my age. We learn too late how great we had it. We were both blessed. Happy Father’s Day to your father from the National WW2 Museum. Happy Father’s Day to you as well. BRC, stay away from Smokey Bear today and don’t let The Boss get a ticket. The Big Red Car is hoping to get a little Father’s Day action today. Seems likely. Happy Father’s Day to you, Jeff.